Before you can run Windows 8’s core apps — Mail, People, Calendar, and Messaging — on your tablet, you need a Microsoft account. Without a Microsoft account, the apps simply display a notice with the words Sign Up for a Microsoft Account. Tap those words to sign up for a Microsoft account on the spot. Before the apps can do their job, they need something else, too: your username and password information from Facebook, Google, Twitter, LinkedIn, Hotmail, and other accounts you may use. Although handing over your password sounds fishy, it’s actually safe, secure, and quite convenient. Armed with your social networking information, Windows 8 dutifully fills out your tablet’s People app with everybody’s contact information and stashes your Facebook and Twitter photos in your tablet’s Photos app. From the Start screen, open the Mail app. From the Start screen, tap the Mail app’s tile, and the Mail app fills the screen, listing any mail you’ve received from your Microsoft account. Tell the Mail app about your other accounts. To add your accounts to the Mail app, head for the Charms bar’s Settings icon: Summon the Charms bar by swiping your finger inward from the tablet’s right edge, and tap the Settings icon (shown in the margin). When the Settings pane appears, tap the word Accounts, and the Accounts pane appears. From the Accounts pane, tap the Add an Account link, and the Mail app lists the accounts you can add. 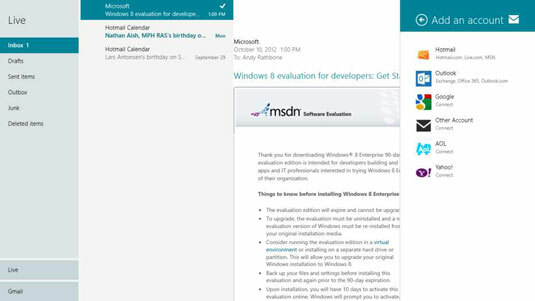 For some accounts, Windows 8 simply adds the information and then collects any waiting mail. For others, like Google, Windows 8 visits a secure area on Google’s website where you can authorize the transaction. As of this writing, the Mail app doesn’t accept POP mail servers. To add IMAP servers, tap the Other Account option and enter your username, password, and IMAP server. Return to the Start screen, tap the People tile, and enter your other accounts. When the People app first opens, you may already see a few of your friends, grabbed from online contact lists associated with the e-mail accounts you entered in Step 1. To stock the app with more of your friends, tell the People app about your social networking sites, like Facebook, Twitter, LinkedIn, and others. Your importing experience will vary from account to account. For some accounts, you simply need to enter your username and password. 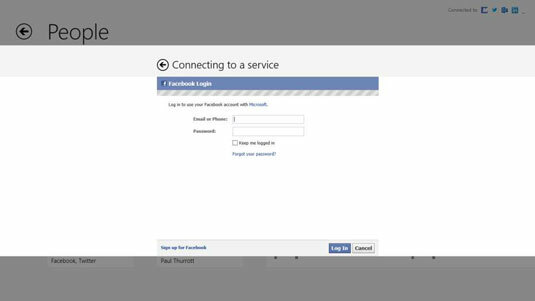 Other accounts, like Facebook, take you straight to their website, where you enter your information to authorize the action. After you enter your account information, Windows 8 finishes the job, filling your Mail app with e-mail, stocking the People app with your friends’ contact information, and adding any appointments to your Calendar app. Your contacts list updates automatically, constantly reflecting your relationships on Facebook, Twitter, or LinkedIn. If you manually add a contact to one of your online networks from any computer, that person’s information automatically appears in your tablet’s People app, as well. If somebody unfriends you from Facebook, or if you stop following somebody on Twitter, your People app silently erases them without notice. In addition to collecting contact information, the People app collects your friends’ latest updates from all of your social networks. When you visit the People app’s What’s New section, you can read everyone’s updates from every network, without having to visit all of them. You can still visit Facebook and other networks to read your friends’ updates. The People app simply provides an alternative way of keeping track of your friends, quickly and easily.